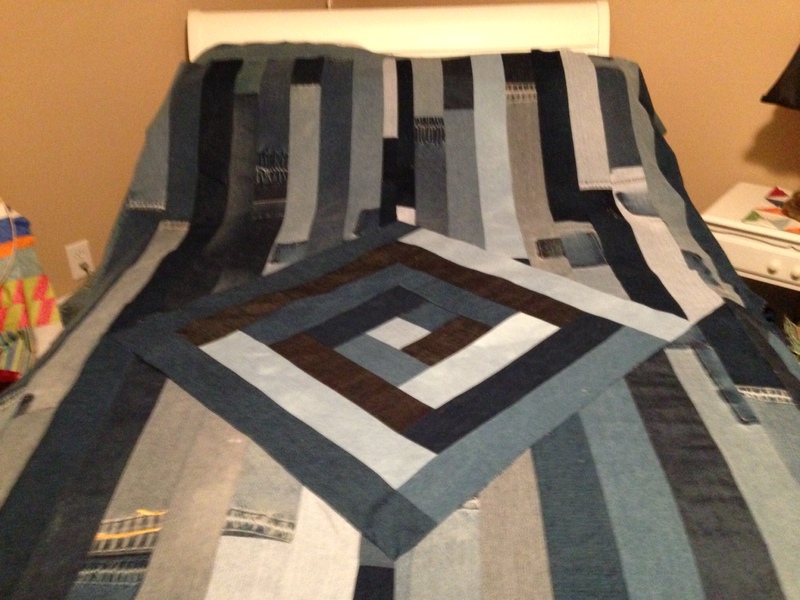 Okay, I persevered and finished another denim quilt. This one fought a long and hard battle. It is the first time that I had to really rip seams and fix mistaken cuts. And not just once. And to add to the fighting, the weight of all that denim had me uttering choice phrases to the sewing machine. I even had to throw my hands up in defeat and leave it for a couple of days while I pondered the best way to finish it. I think it all boiled down to four diagonal set-in seams. I have never been a big fan of set-in seams anyway, but that they were on a bias and diagonal didn’t help. Oh and yeah, broke four! needles in the process. Denim is not kind but I love the end result. Now I have three more denim tops completed and have really paired down my stash of recycled denim, I am going to swear off working with it for a while. I flipped through a few books and magazines that I’ve marked with possible ideas but nothing seems to be sparking or lighting a fire under me. Maybe I need to take a break from sewing and concentrate on finishing at least one or two of the Victrola cabinets that I picked up a few weeks ago. I’ve decided with one that I am going to turn into a little bar… with a little ice tub and a place for bottles and decanters and store glasses and napkins in the cabinet where albums were kept. I am thinking a walnut stained top and painting the cabinet a deep brown. The other cabinet is going to be an entertainment cabinet… using the former horn as an amplifier for an iPhone/iPod/music player and then adding a turntable and also making place for game controllers. This piece is going to be walnut stained top with a deep red/maroon cabinet. I think this will be really sharp. There are two additional cabinets, a taller one that I think The Kid has his eye on it to be restored to the same sort of end product… a place for gaming systems and also a music system. And the last one has the makings to be the perfect bathroom vanity. I will have to replace the top with a solid piece (it splits in the middle right now), but I could see this is a beautiful ivory with maybe a piece of granite or ivory on top. Guess we’ll have to see how this proceeds. Tomorrow I may go down to the Habitat’s ReStore and check out what they have in terms of granite or ivory and if they might have any vessel sinks that might work. Or any other interesting pieces that might be fun to work with. I still have the whole garage/shop job that I have planned, a post for another day. Have been taking it a little easier since we’ve completed and delivered the doll house. Working on some smaller items while I relax a little. 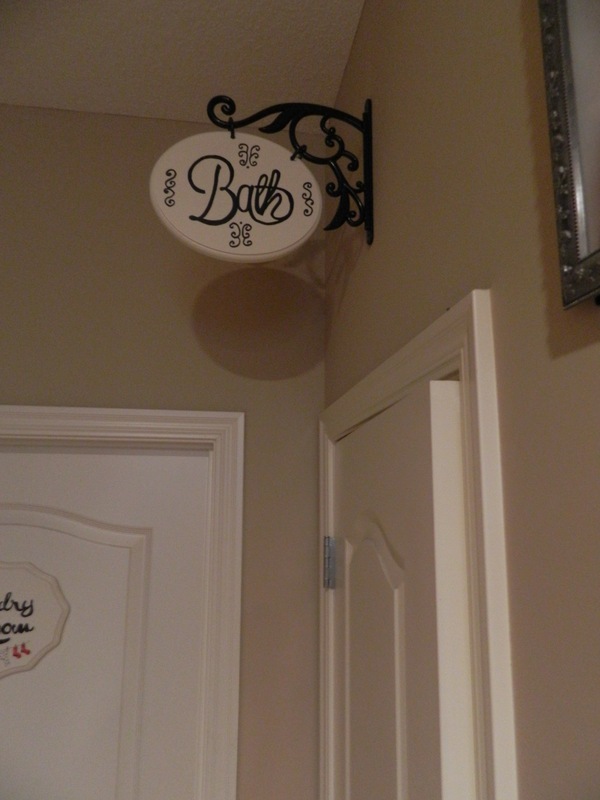 A couple of things that I wanted to do but never seemed to have the time to do, was to create a sign for the half bath that is down at the end of the hallway. There are two doors together, one for the laundry room and one for the bath. Inevitably, guests sent down the hall open the wrong door. I saw a sign like this on Pinterest, I think, and knew I wanted to do something similar. This was done with a plant hanger (Home Depot) and a precut and routed plaque (Joann’s) and then just searched online for a font that I liked. I did this all freehand, although I was looking at specific designs for reference. I then used plastic shower curtain rings that I split with a hack saw and just slipped through holes drilled in the face and then around hanger. Hand painted the two rings black. Then two screws and it was done. I thought that having this particular door completed sort of made the other one seem kind of, I dunno, bare. 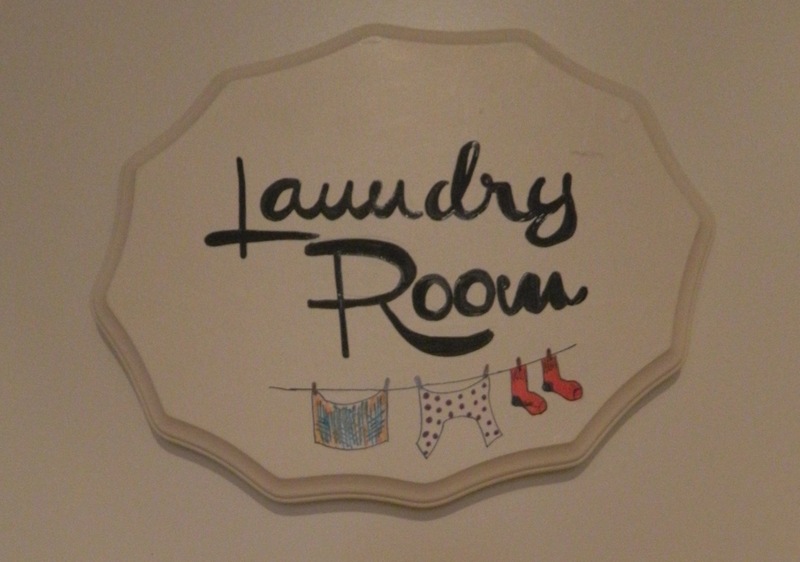 So, I created another for the laundry room. I wasn’t paying much attention and I created the lettering just a little tilted, so I just mounted it on the door a little tilted as well. Unless you know that it isn’t level, I don’t think you’d notice. I’ve always been one of those people who seem to never be able to sit still and just watch television no matter how interesting the show or movie. I have to have something to do with my hands. So I hand sew, or paint or decorate or create jewelry. My latest diversion is creating food and accessories for the 18″ dolls. Once they have a kitchen, they have to have something to put in it, right? These are made from 1 1/4″ diameter dowels and the labels were printed from images I found online. I sized them correctly once, created a template for future labels in Photoshop. I used a real can and figured scale, something about 1:3 and 1:4. Mark the interval, also 1 1/4″ and cut them on my band saw. I lined them up and spray painted the tops and bottoms silver like cans. 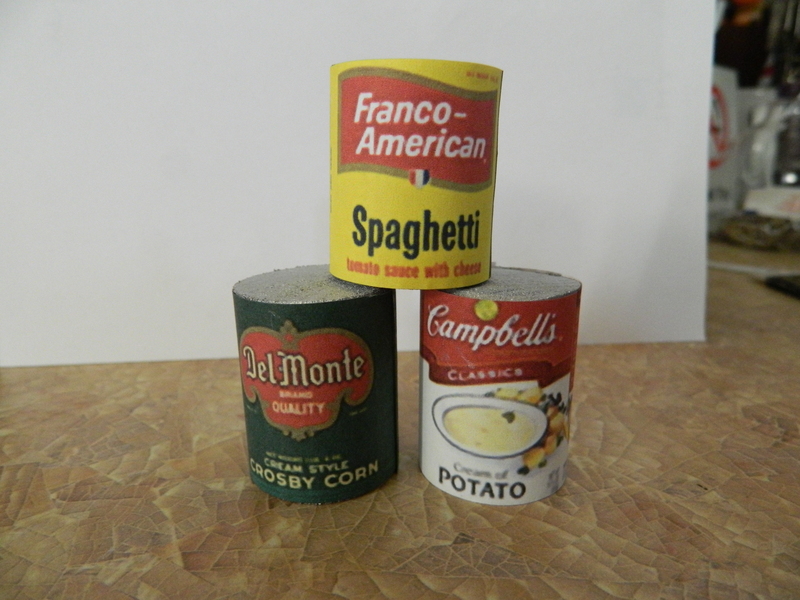 Then simply cut the labels out and adhere (I used a glue stick) onto the “cans”. I cannot wait to get the pantry in my doll house’s kitchen filled. I am also working on cereal boxes, pasta and mashed potato boxes and if I can find the right sized jars, I will do peanut butter, jelly and salsa as well. It allows me to be able to sit and still create. And speaking of creating, I purchased a set of ‘knives’ on eBay for my kitchen. 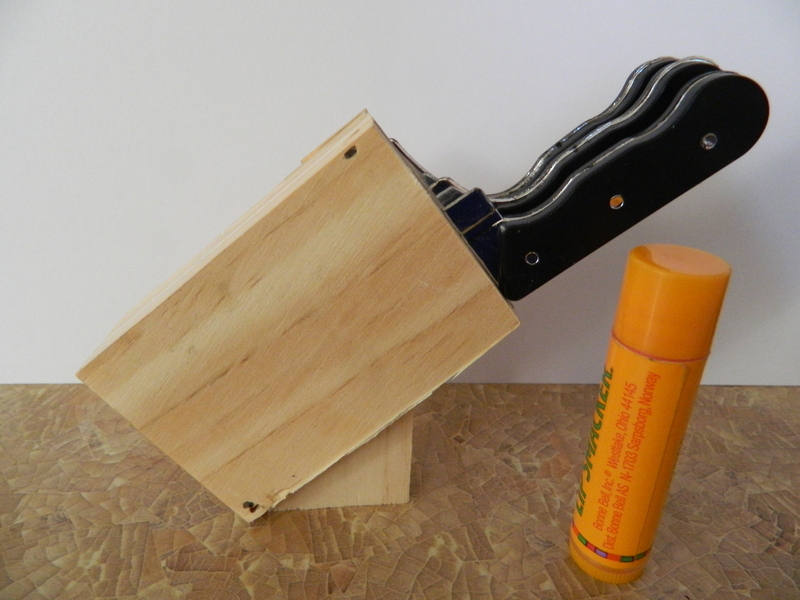 And the Kid did a wonderful job creating a small knife block for it. Didn’t it turn out wonderfully? I included the chap stick so you get a sense of scale. And yes, the knives do come out of the block. 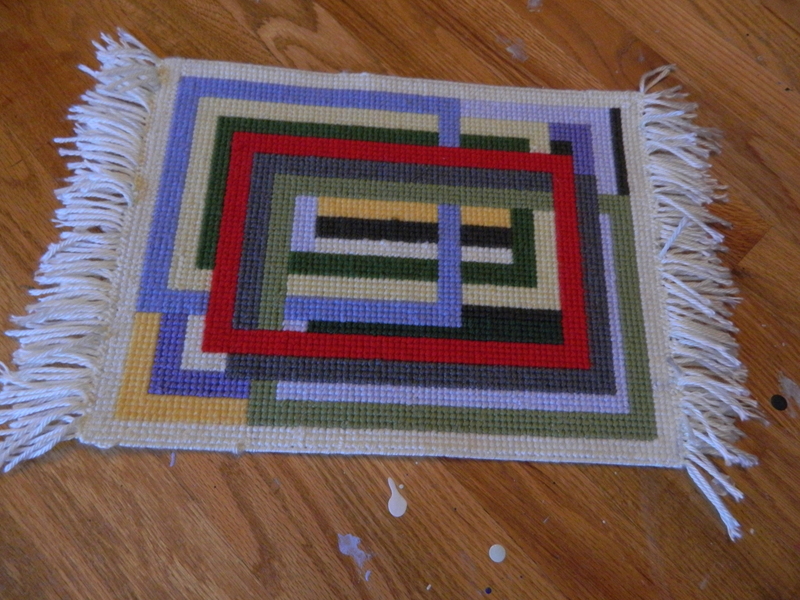 Once I had it all finished, I added the fringe on the two shorter sides to give it a more authentic look. I used plastic canvas so that it will last longer, I think it may be a bit more durable. 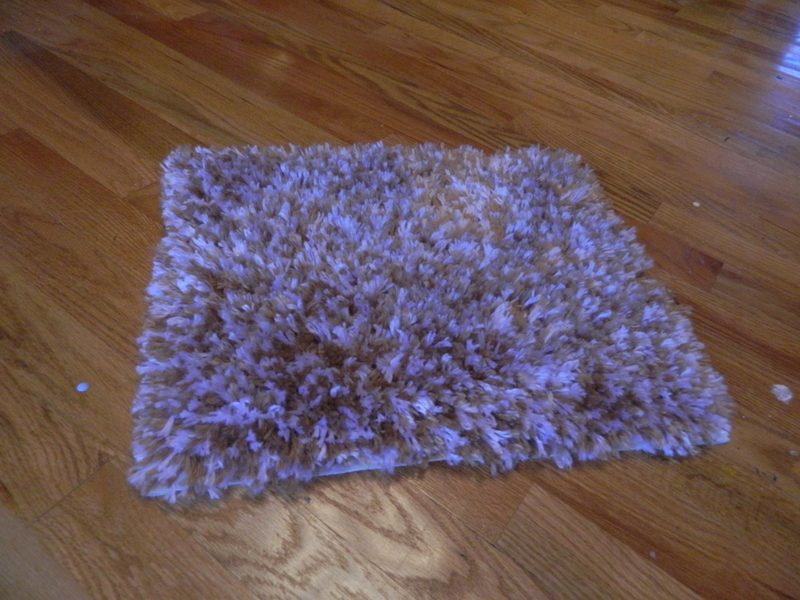 The other is a hooked rug that I made using brown and white alternative yarns. It is very soft and will look nice under the corner of a bed or sofa. And with that, I will wrap up tonight’s blog. It looks to be a beautiful day tomorrow, or so I hope. I think the Kid and are hoping to plant strawberries in the garden out in back of the house. A nice wet area that gets lots of moisture and sun. Thanks for stopping by and come back soon! Oh, and as always, keeping making beautiful things just for the sake of it!